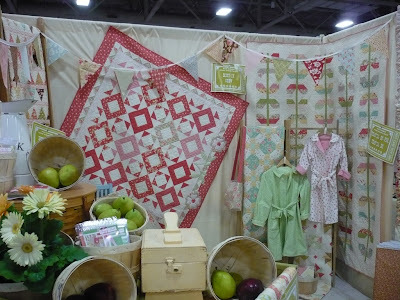 Quilt Market Spring 2011: Vol. 5 and a Giveaway!! So today's post will be the last of the Quilt Market posts for Spring 2011, but no worries there is a giveaway (actually two) at the end! I will not be writing a personal experience post this time around as there is just too much to say and I don't really feel like I can put it out there right now. No worries though, I had a good time and got to talk to lots of people and get some business-y stuff done so it's all good! 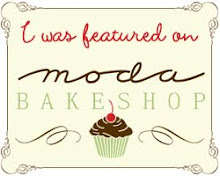 Without further adieu, it's Moda time! 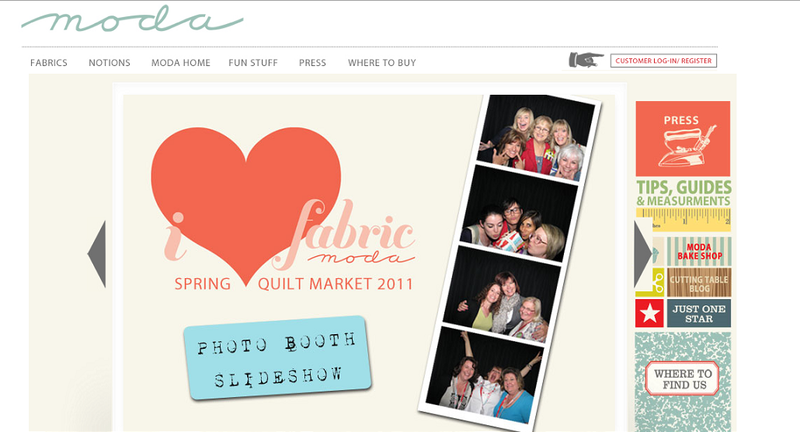 Did you see that Katy, Heather, Aneela and I made the front page of the Moda website?! Click on the picture for a better look - we're in the second picture from top smooching on Aneela's upcoming line Little Apples. Good times all round I say! I do have all the photos we took in Moda's photo booth (three strips worth!) but I don't have a scanner, however you can view all the pictures over here on Heather's Flickr. Oh look, it's Sandy Klop of American Jane fame! Sandy is really one of the sweetest ladies ever and Doe is just silly in love with her! I'm in love with her too of course because she really is one of the nicest people and she actually remembered us from last year. 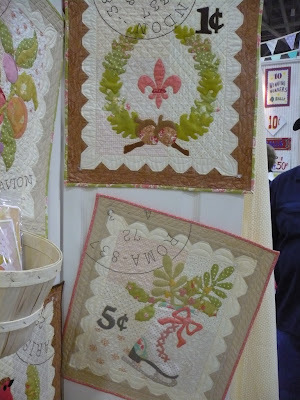 Both of the above photos are from the Fig Tree & Co. booth; the booth was absolutely gorgeous again this year and I am really loving the stamp-like mini quilts! I didn't really get a chance to talk with Joanna this year (although I think we may have said hi at the Moda party) but Eric and I talked hockey again just like last year! San Jose went down just like I told him they would (ya, that's right, take that Eric!) and Vancouver is in the playoffs - woot! The Oliver + S booth! Liesl debuted her third line, Cape Ann, which will be available in the Fall. I just love the little dresses and the small diamond dot (that's what I'm calling it anyway) especially! Cute cute cute! Unfortunately the above pictures are the only ones that survived on my camera - I know for sure that I took pictures of the booth Aneela was sharing with French General, Cabbage and Roses, Cosmo Cricket, and Lauren & Jessi Jung, and Bonnie & Camille's booth for sure! Geez! This copy is for you! 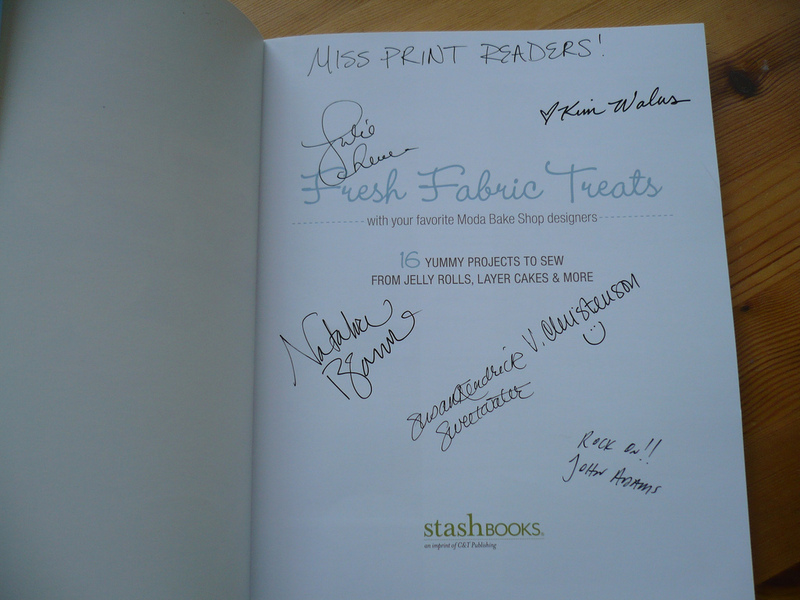 That's right, one lucky Miss Print reader (see how it's inscribed and everything) will win their very own copy of Fresh Baked Treats signed by the six designers mentioned above - and don't worry about me trying to snake this copy, I already have my own (signed by the amazing Lissa too! )...but wait! There's more! A second winner will win the two petits fours pictured above! 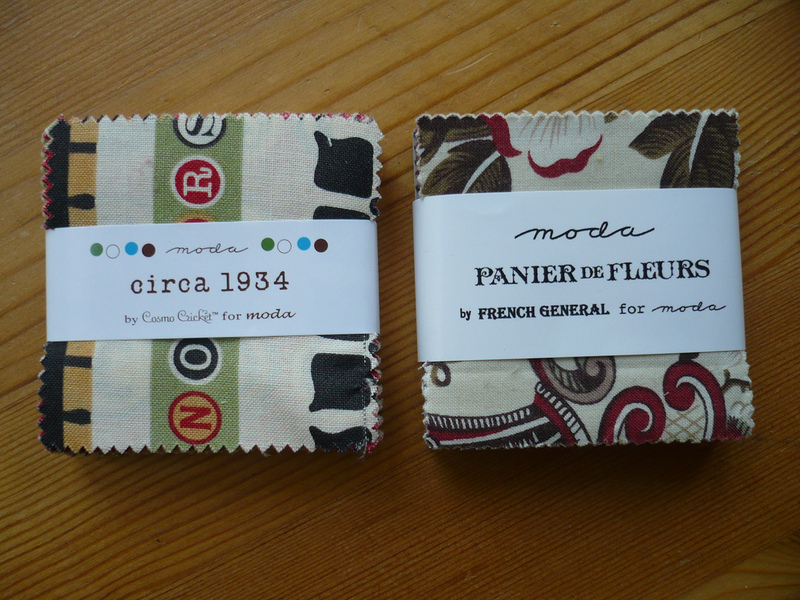 Each petit four contains 42 2.5" squares (just like a charm pack but one quarter of the size); the two we have here are French General's Panier de Fleurs and Cosmo Cricket's Circa 1934 (yes, it's true, Cosmo Cricket is now with Moda)! These are very special little guys and are not readily available on the market - and guess what? If you're into making hexies these are the perfect size for making 1" ones! would like to see from Market in the future! 2. Leave a second comment if you are a follower, or if you become one. new thing that I've just started and I'd like to see some of my peeps over there. I will be announcing special things there that I may not announce on the blog. There ya go - that's three ways to enter! Please remember to leave separate comments for each of the three things; you don't need to do all three but it will increase your chances of winning! Oh, and also remember that I do have comment moderation enabled so if your comment doesn't show up right away it's just because I haven't approved it yet. I will leave the giveaway open until next Tuesday (June 7th) and then I will announce the winner here on the blog! You want to see more pictures from Quilt market you say? Well, here we go! Today I'll be showing some of the "other" booths - you know the ones that don't fall into one of the bigger categories I've already done, or Moda (which I'll be doing next along with a little giveaway, so stay tuned). Oh first, one piece of business - my pattern Itching to be Stitching is on sale for a little more than 50% off right now as part of Meylah's weekly special so if you've been eyeing it now is the time to get it! Oh Kona, my love! 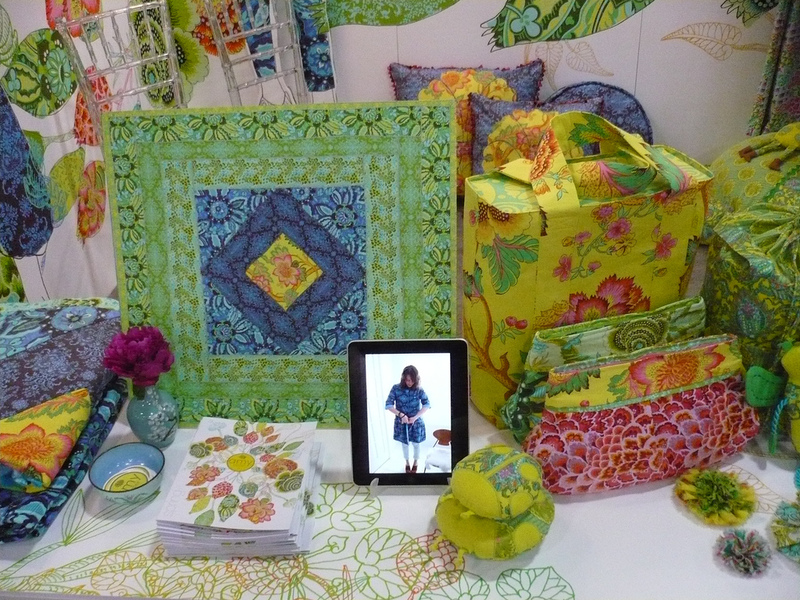 I loved the Kona booth a lot - just look at all the lovely colours and wealth of solids just splashed about! 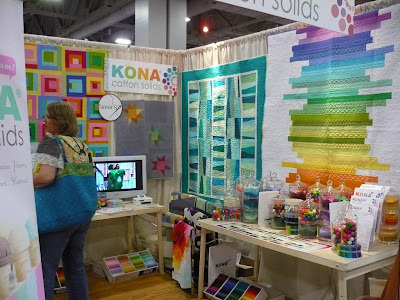 I want one of those solids Bounty of Basics boxes so much (or both actually) and did you know that Kona actually makes the boxes for a bunch of their basics and blenders? Very cool. 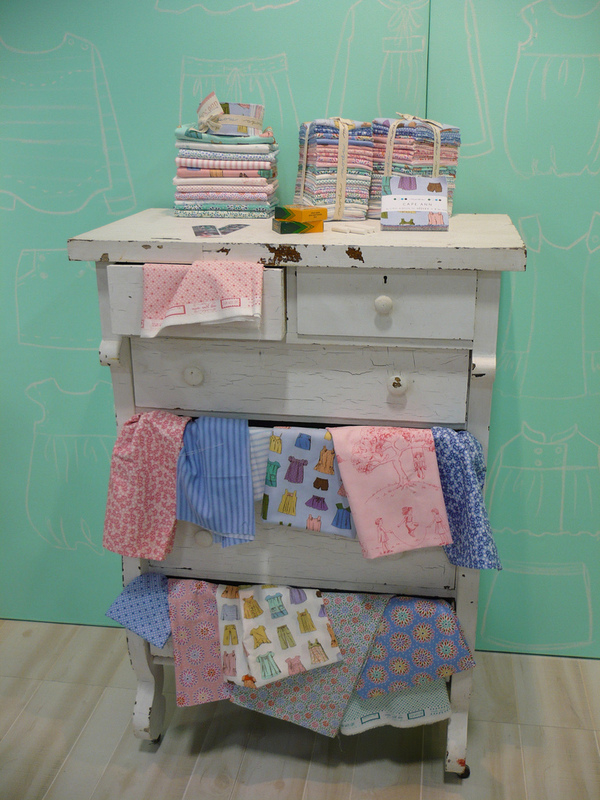 Kona also gave me a colour card while I was in their booth and I literally jumped for joy - seriously, I was so ridiculously excited about it! 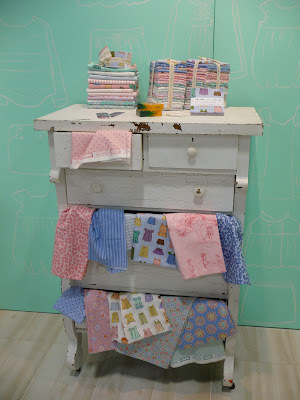 The Birch booth! 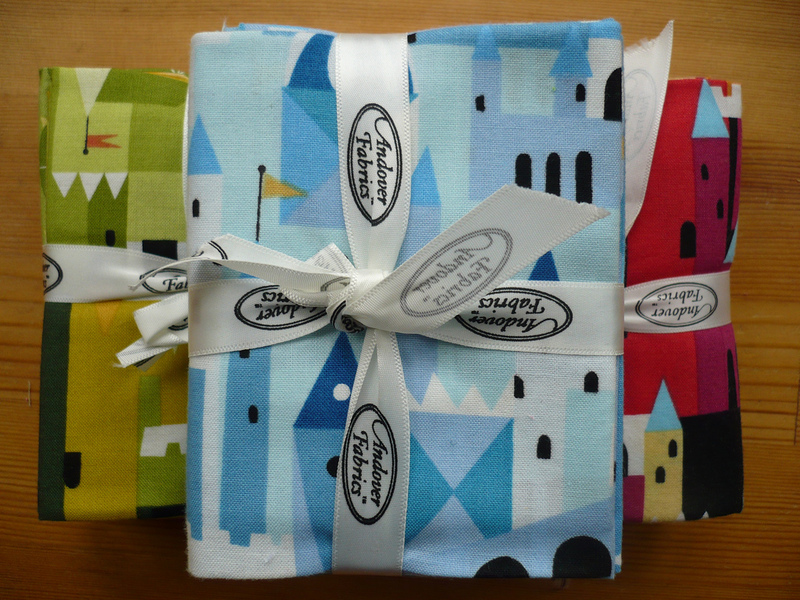 I love Birch fabric - it is all just so gorgeous and the colours are amazing! 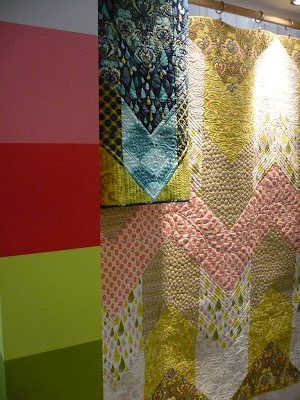 The quilt in this picture was done by the super-talented Elizabeth and I think it is ridiculously stunning! Birch is also reprinting certain prints from it's Circa 60: Beach Mod collection including one of my favourite prints ever - Happy Campers (which I actually don't own by the way which is very very sad)! I completely missed getting pictures of their soon-to-be-released Storyboek collection but let me tell you it is awesome! Echino! Really there's nothing more to say about it than that! And guys, now I really know for sure that there are pictures missing from my camera because I know for certain that I took pictures of Heather Ross' Far Far Away III collection when I was in this booth because they had a wall of it that was amazing! Yup, something seriously weird happened - I'm going to blame it on the altitude in Salt Lake City...yup, I am. And now for some Paula Prass love! 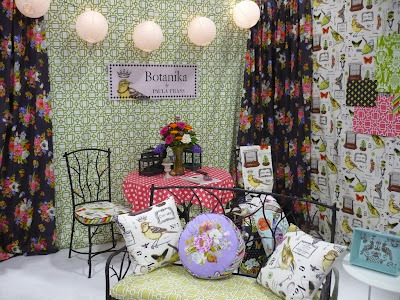 Here is Paula's booth featuring her new line Botanika and even though her new fabric is gorgeous (and I will definitely be getting some) this little section will not be about that. I don't think I can ever express how much I love, like (yes, love and like are two different things), and respect Paula, and I know that I will never be able to really let her know just how much her encouragement and kind words have meant to me. Paula and I first "met" each other online a bit over two years ago when, after showing him a picture of some of Paula's fabric online, Alex bought me some; I left a comment on Paula's blog telling her about it and letting her know how much I loved her work and she actually wrote back to me! Since then I have continued to be inspired by her life and work and am in constant awe of her talent, beauty, and strength. We finally had the chance to meet at this Market and I can tell you it was a real highlight of my time there - Paula (and her daughter Jennifer too!) is just as warm, kind, gracious, and giving in person as she seems online. I love you Paula and I hope you know that. 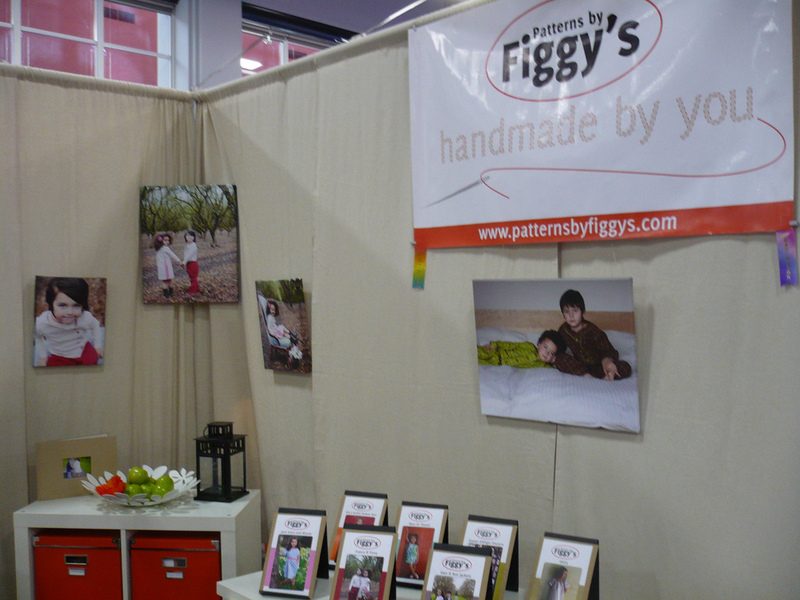 And last, but not least, for today is the Figgy's booth! Um, so ya, I think Karen and Shelly are pretty flippin' awesome and they are a true example of the power of the online craft community - they met on Flickr, yup Flickr, and even though they live thousands of miles apart, they run their pattern business together across that distance and have been making a real success of it! Here is Shelly peeking out from behind one of their super-cute jacket designs! I didn't manage to get a picture of Karen because she had gone traipsing off somewhere by the time I remembered to take my camera out! See that chair there behind Shelly? Ya, that was another of my sit down and stop spots - I think I spent almost an hour in that chair on Sunday morning before I left for the airport. Thanks girls, not only for letting me borrow your chair, but also for being so super-awesome and fun! 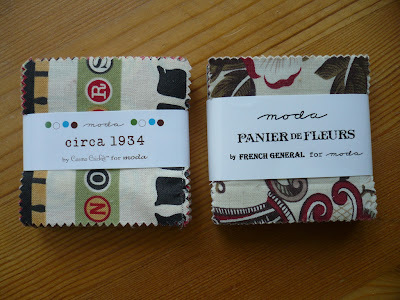 Alright, that's it for now but I'll be back soon with my final Market post and all the Moda goodness! Alright, who's ready for Free Spirit part 2?! Woot, let's go! 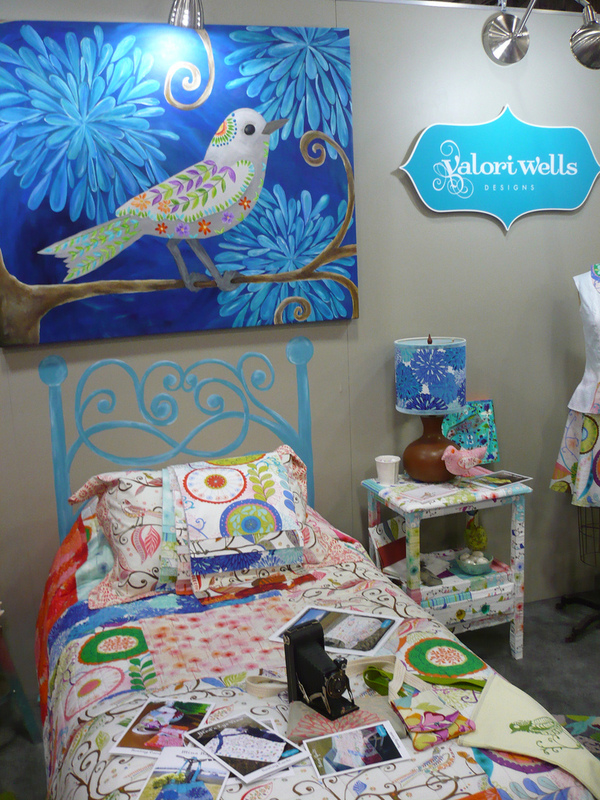 Let's start off today with the ever-sweet Valori Wells' booth - Val is my girl and I love her to bits and pieces! She really is one of the most generous, giving, and kind people I have ever met and I am super-lucky to call her my friend (and super-lucky that she always had a place for me to sit in her booth when my feet got tired)! Now isn't that painting in Val's booth just fantastic?! 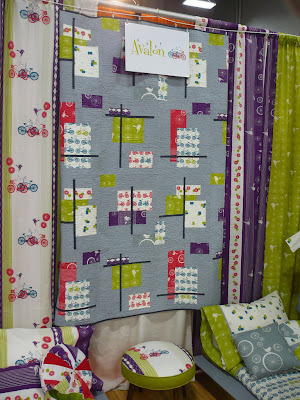 And the quilt on the bed is one of the most lovely things I've ever felt - it was voile with silk batting, yum! 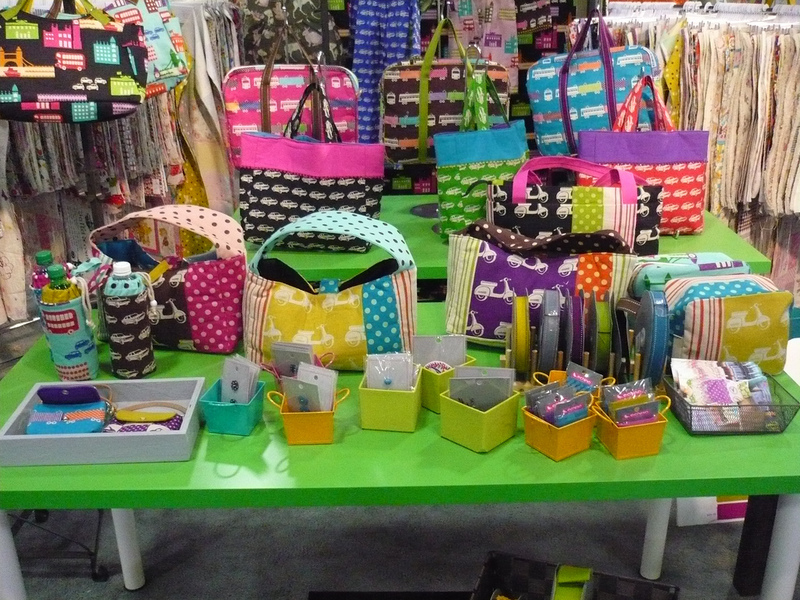 I am always in love with Val's colours and her new collection Wrenly does not disappoint! I spent a good amount of time sitting on this gorgeous couch (and the orange chair next to it that can't be seen in the picture - actually now that I think about it I'm pretty sure I was sitting on the chair while taking this picture) and just in case you want proof, take a look at Val's post here! On the Saturday I spent over an hour hanging in Val's booth, first with her mum the uber-talented Jean Wells (who I also *heart* a whole lot) and then with Val. I may have also spent some more time there on both Friday and Sunday with Val and Carolyn, but Saturday was definitely the longest stretch. My poor footsies appreciated it more than you know Val! Unfortunately I don't have any pictures of me and Val - boo, I know! But what do you think of Val's awesome fabric and copper wall hanging? 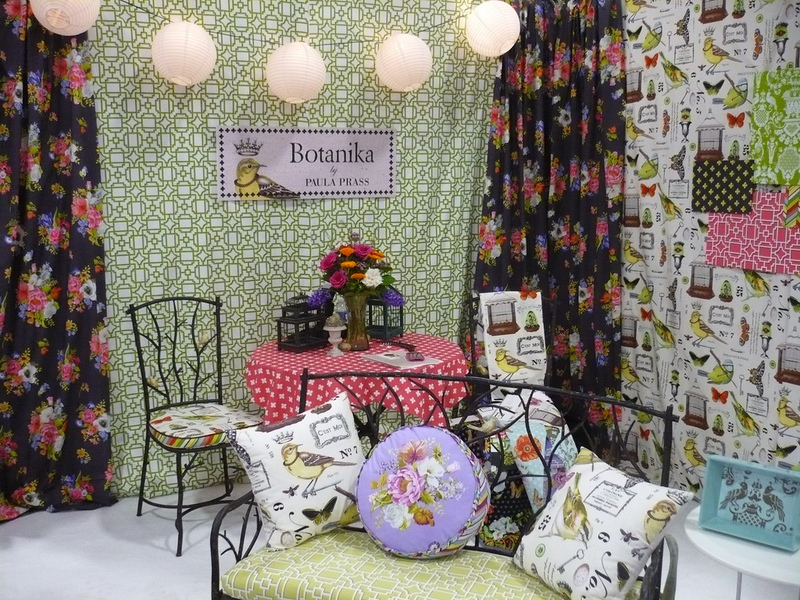 Or the cool fabric birdcage? Frankly, I could have lived in Val's booth for sure! Hmmmm, let's see...who's next? Well why not Joel Dewberry? 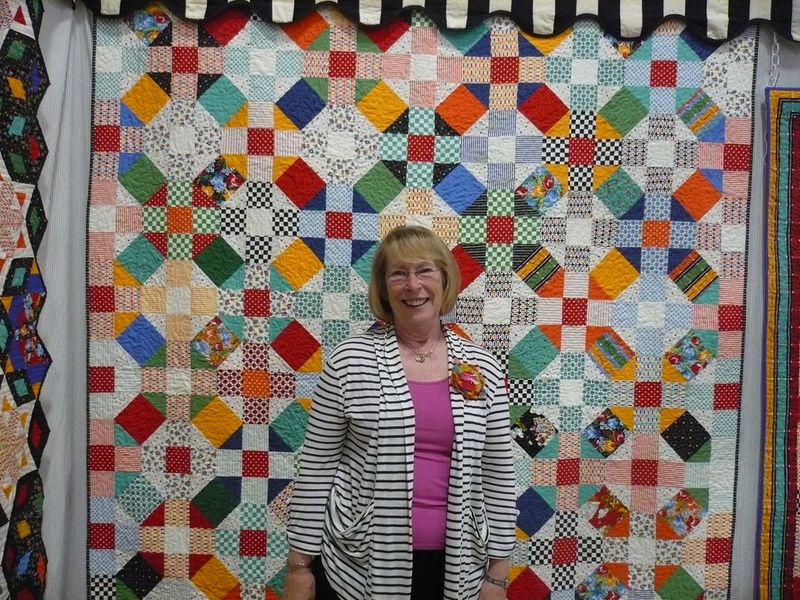 Gotta represent the men in the quilting industry don't we? And I mean really - he's Joel - he's awesome! 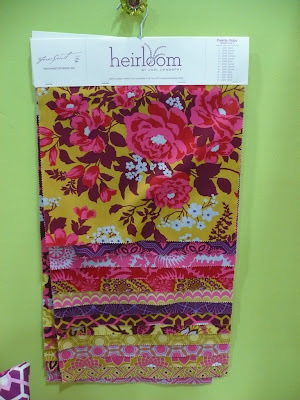 Here's some of the samples from Joel's upcoming line Heirloom ; the colours are absolutely gorgeous and you can see a small peek of one of the other sample sets in the photo below. 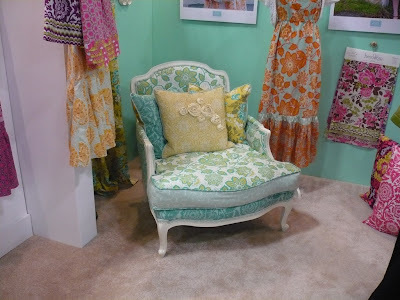 I thought this chair was just beautiful and wanted to take it home with me so bad - it would match our living room perfectly! The skirts that Joel's wife, Laurie, designed are really pretty and I think they'd be super-flattering. 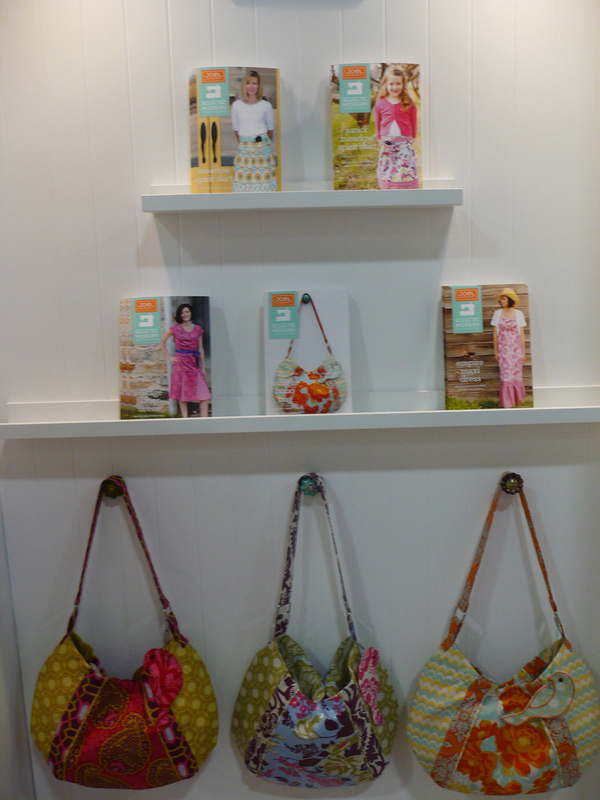 Here are some of the patterns and purse samples made out of the laminate! Laminate = yum! Unfortunately I didn't get any pictures of Joel's full booth because it always seems to be packed with people but you can see the full thing over here on Joel and Laurie's blog. 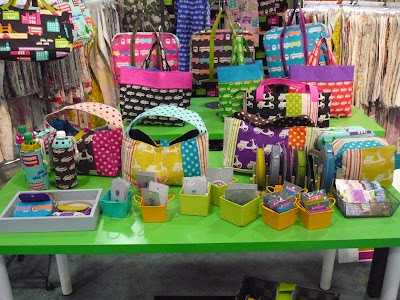 And last, but definitely not least by any stretch of the imagination, is one of my favourite people - Tula Pink! Tula is totally awesome (as are her mum, Kathy, and brother, Cam) and is one of the funnest people to hang out with. On Saturday night when I was venturing out to meet Val and Carolyn for drinks I ran into Tula, Kathy, Cam, Mark (a new designer with Free Spirit) and his wife Cara; they ended up coming along with me for drinks and we had a really great night! 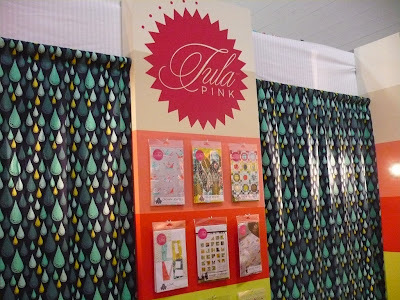 Tula had her patterns displayed along the back of her booth with curtains made out of a print from her new Prince Charming line' Prince Charming is gorgeous by the way! The colours are very similar to those used in Neptune but the tones are deeper and richer (in my humble opinion of course) and I think that creates a higher impact, more saturated feel. 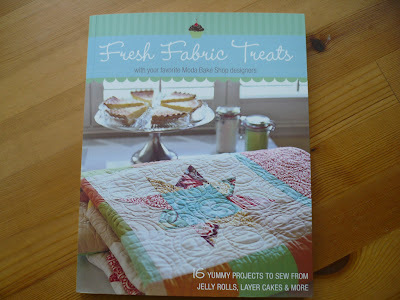 I can not wait to get my hands on some so that I can start a new quilt! 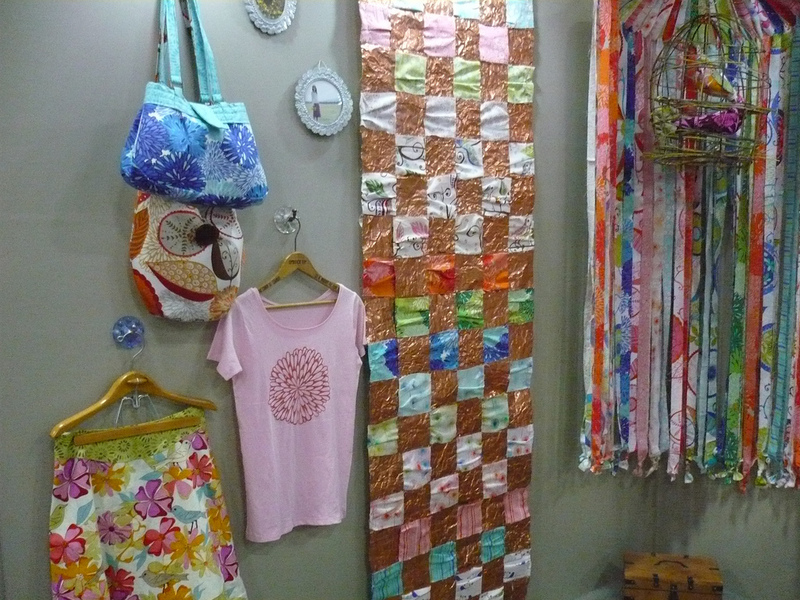 Quilts hanging on the right side of the booth quilted by the super-talented Angela Walters of course! 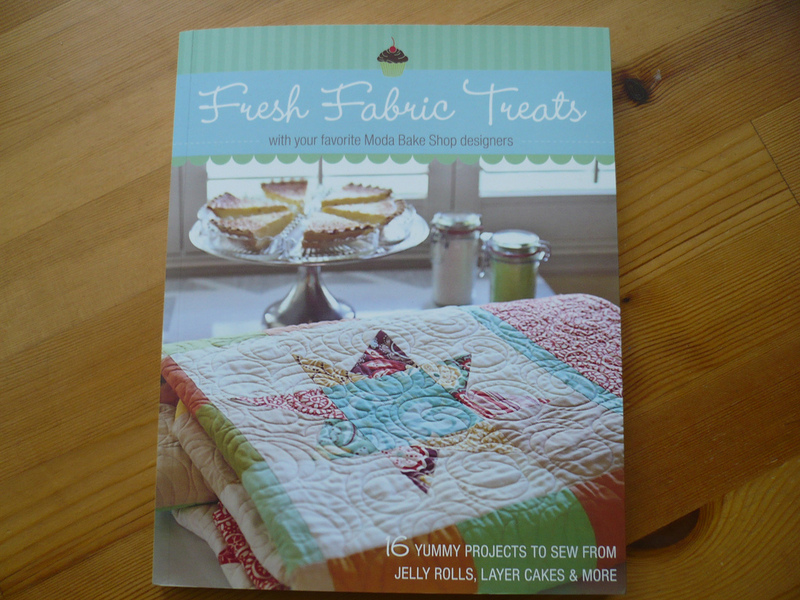 Did you know that Angela has a book on machine quilting coming out with Stash books - woot! 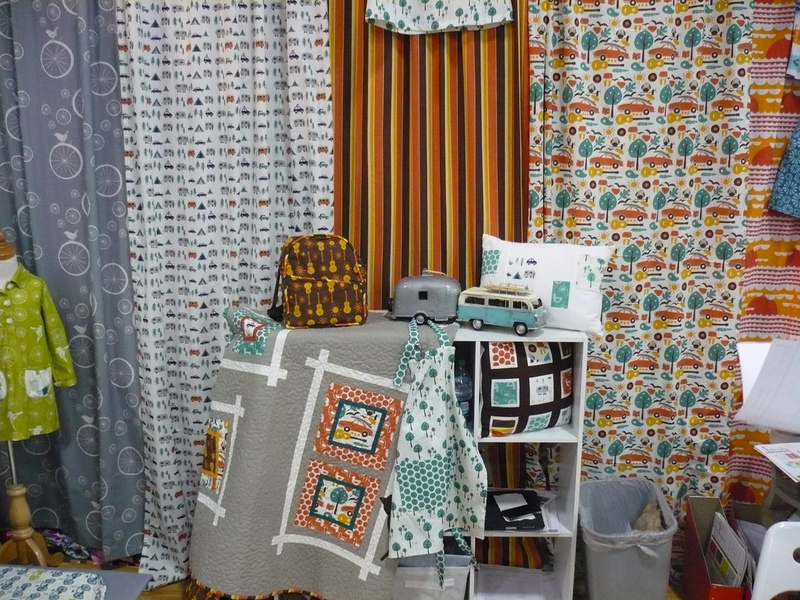 Here are the quilts on the left side of the booth! 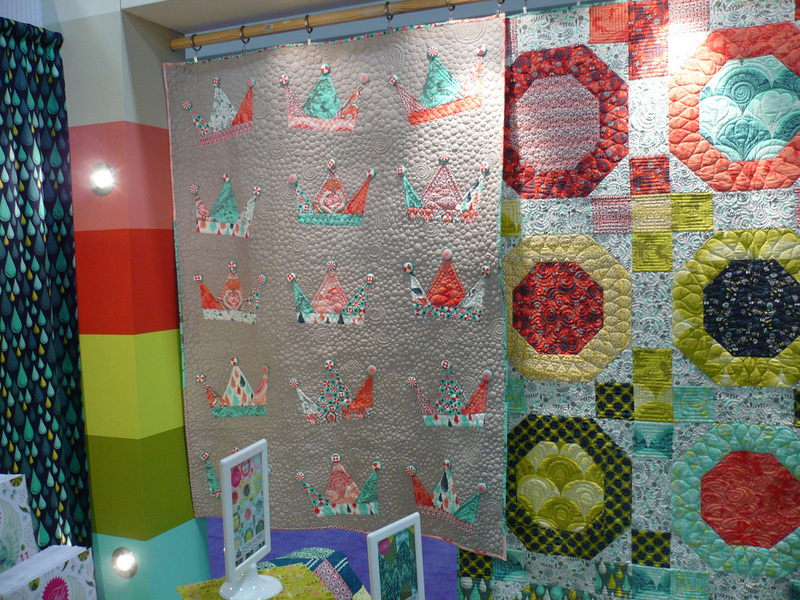 Loving the cover buttons on the Crown Jewels quilt and the one on the right (Snow Globes) has the amazing giant frog backing that we've all been drooling over lately! Again, I didn't get the best pictures of the whole booth but rest assured it was awesome - Tula won second place for best single booth! If you need photo confirmation check out her post here! Alright, well that's it for this post! What do you want next? Moda? The organic cottons? Some pattern companies? Everything else (haha!)? 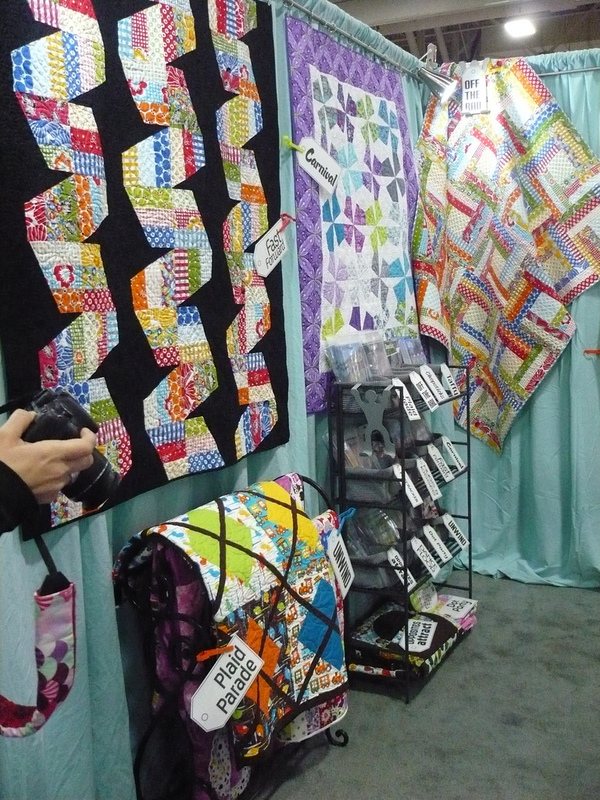 Quilt Market Spring 2011: Vol. 2 and some fun news! 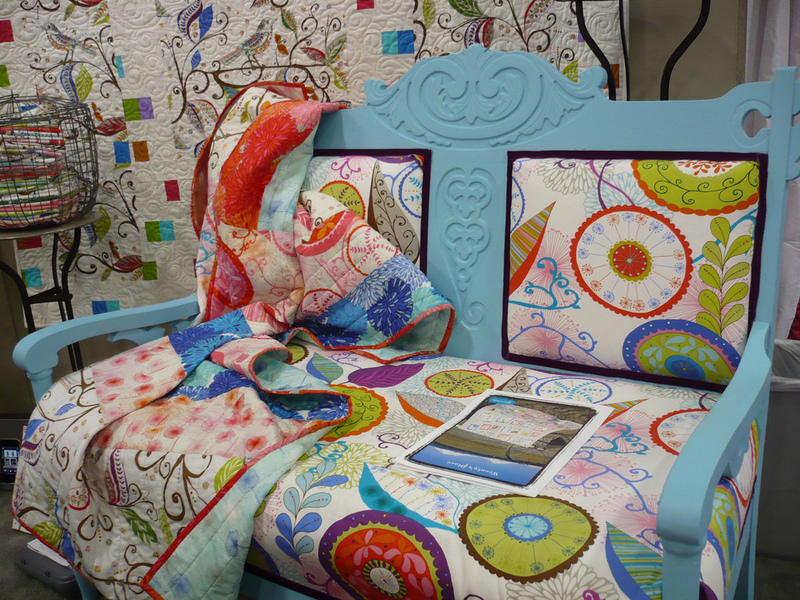 So before moving on to some more pictures and happenings from Quilt Market I thought I would share some pretty fun news with you! 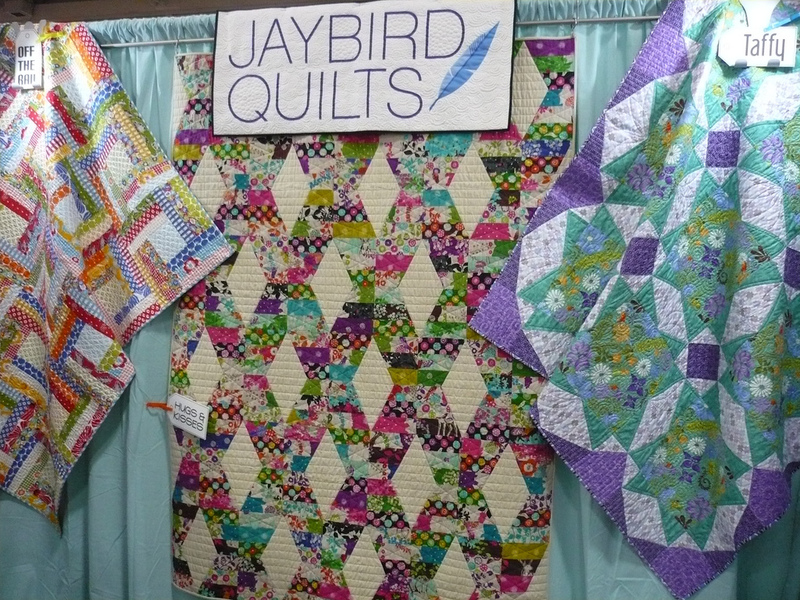 As I was getting off the plane in Salt Lake City I turned on my Blackberry and found an email from Jennifer waiting for me; the subject was Quilter's Home Magazine and here's what it said: "Holy crap! 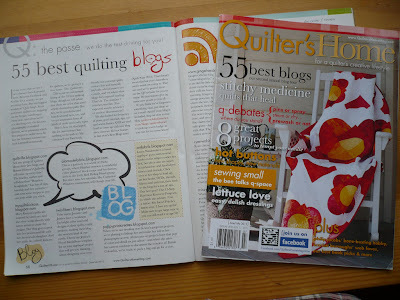 did you know you were one of the 55 Best Quilting Blogs?? I'm squealing! "...Um, what?! Yup, it's true! 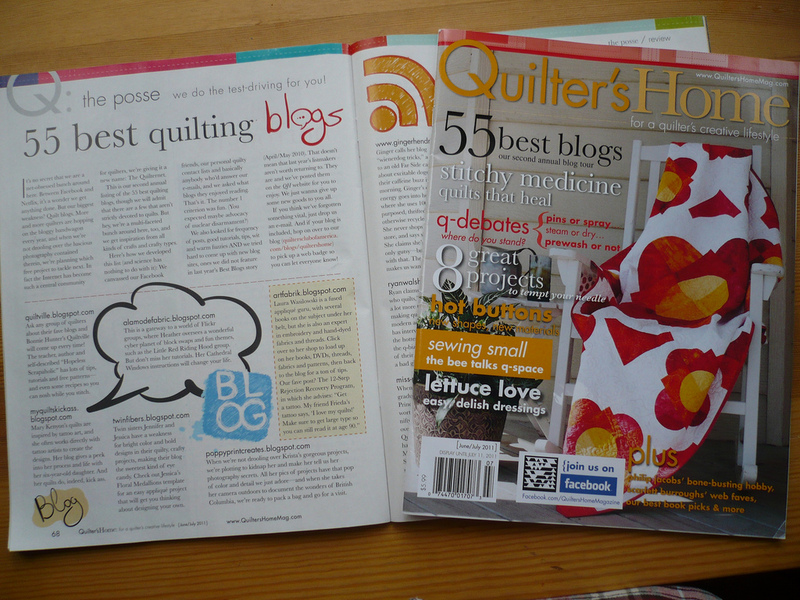 Jennifer had spotted my blog in the list, which is included in the June-July 2011 issue, while reading the list on the Quilter's Home website (you can view the entire PDF of the article here). 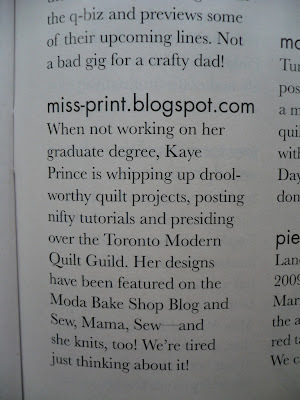 Here's the little blurb they wrote about me and my blog! Isn't that just the sweetest? Also included in the list are my awesome peeps Heather and Ryan and a number of other bloggers that you will surely recognize! 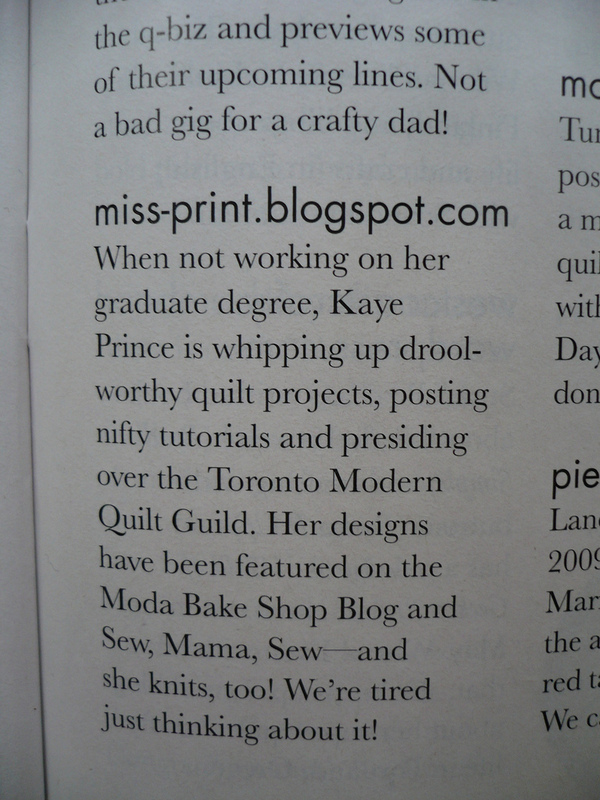 I'm pretty excited about it and I found it really nice that they mentioned my graduate work (which many of you know I have now completed - my convocation is on June 2nd) since I find that that part of my life is often not important in the crafting world - not that it necessarily should be but it's nice to see it recognized in this sort of venue. 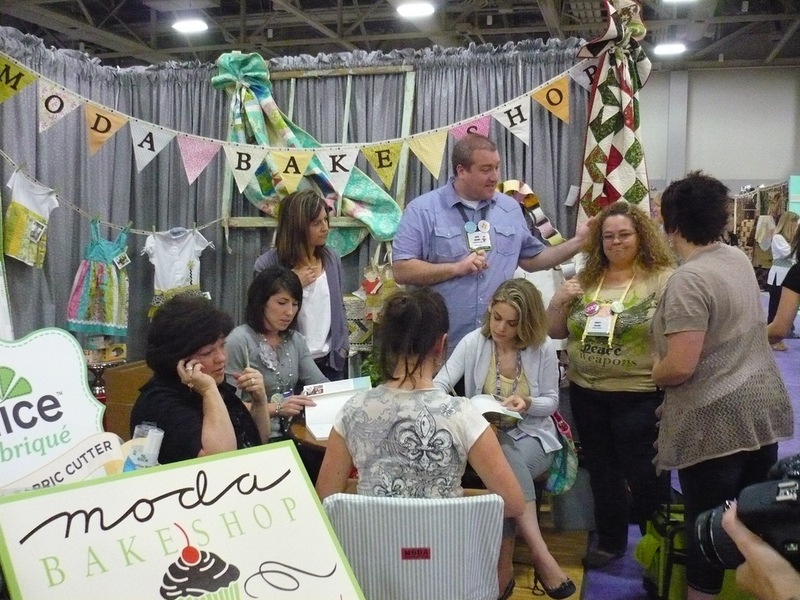 Okay, now let's see...whose booths should I show you next? Oh, I should mention that after I got home and looked at the pictures on my camera I realized that very few of the pictures actually have people in them, that there are none of my friends and me running around (although I know they were taken so they must be on other peoples cameras), and that there is only one picture of me. I know! I also don't have pictures of a few booths that I could have sworn that I took pictures of so they must have disappeared into the ether! How about a couple of the Free Spirit and Westminster designers today? I actually have a lot from Free Spirit so I'll do a couple today and then a couple in my next post! 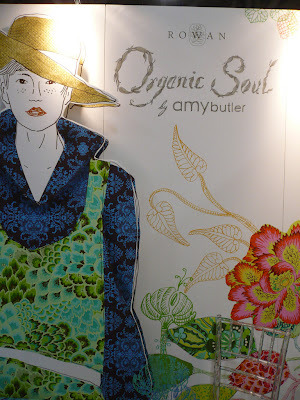 Let's start with someone that we all know and love (and the only booth that includes a picture of me too)...Amy Butler! 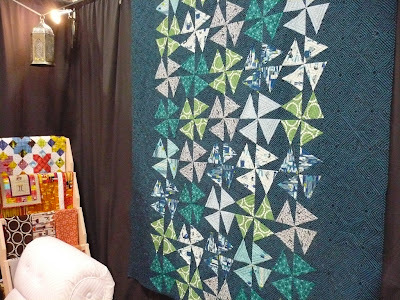 Amy had a rather small booth this time around and I found it difficult to get good pictures of the whole thing. She debuted her new collection Organic Soul which is all 100% organic cotton - good lordie, you should feel the corduroy (nice thin whale), it's like butter! 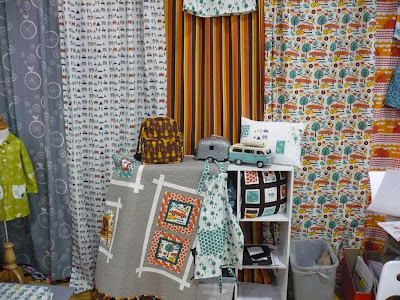 This was the little display at the front of the booth and similar to Lizzy's booth she had a iPad rotating photos of the fabric and patterns. Amy and me! This is the one photo on my camera that had me in it and geez (!!!) I look like such a goober! 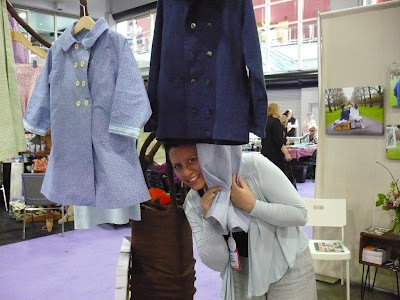 I asked Amy if I could take a picture of her in her booth and got all silly-excited when she asked me to be in it with her. I know - I was completely starstruck! I did see Amy at Quilt Market last spring but didn't actually talk to her so I was pretty happy. 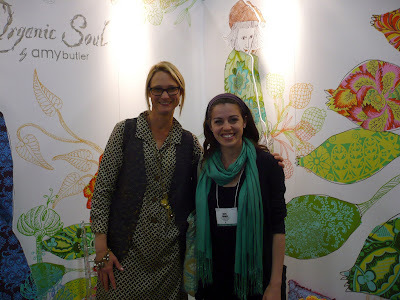 She is also super-tall by the way - I'm 5'7 and she's towering over me! Ohhh, Anna Maria Horner and Loulouthi! 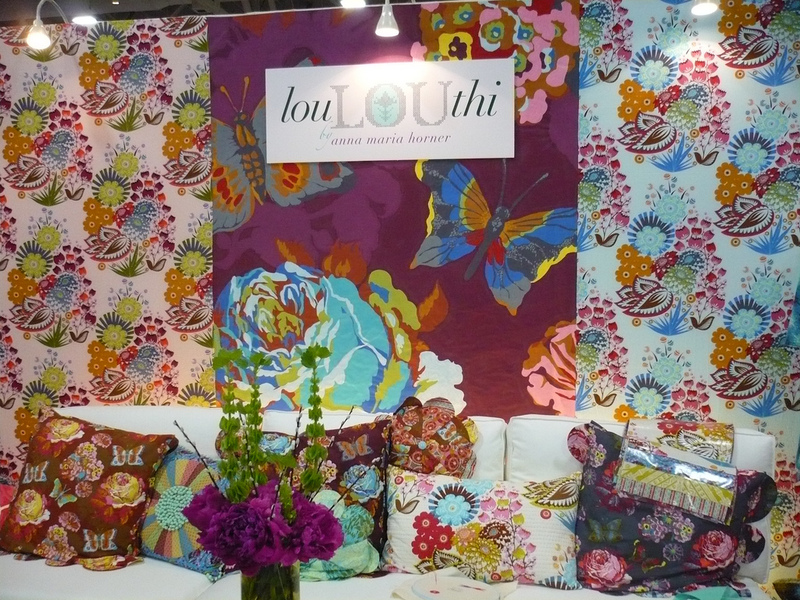 Anna Maria's booth was just as gorgeous as ever and let me tell you, Loulouthi is just beautiful in person! Anna Maria told me that throughout the year it will be released on various substrates including quilting cotton, voile, flannel, corduroy, velveteen, and laminate - basically everything except for home dec. 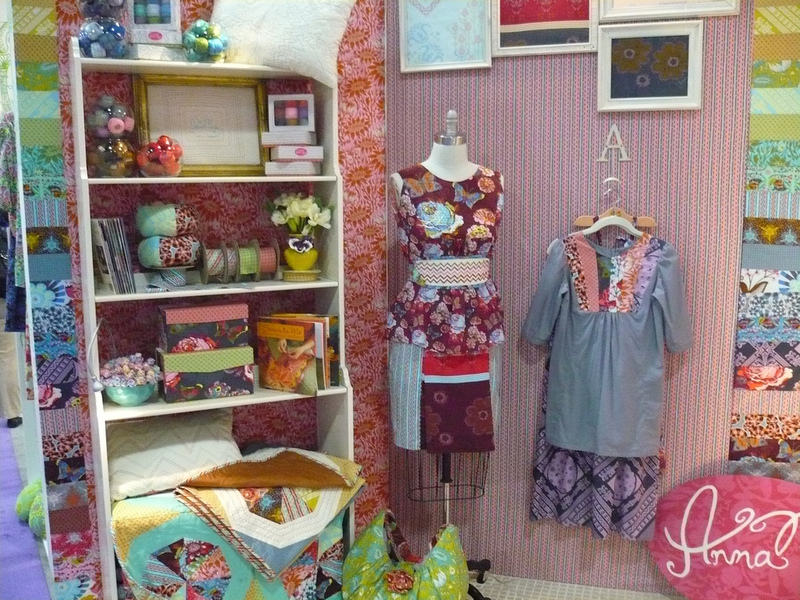 This little corner of Anna Maria's booth was just so gorgeous and I wanted to take everything home with me especially the grey tunic which was exactly my size! 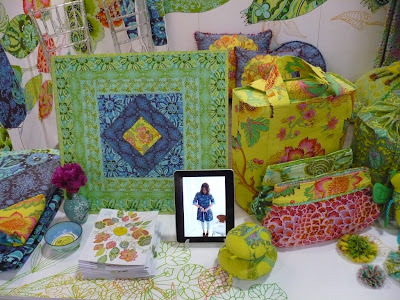 Anna Maria told me that she is coming out with her own collection of perle cotton and embroidery floss as well as pre-printed aida - now isn't that just neat?! Cross stitch is really picking up in popularity again I think now (just like any craft - it goes in fits and starts) and I am so happy to see some of the big designers acknowledging the trend. Hey all! I got back from Quilt Market after midnight on Sunday night (flight delays and holding over the airport made for a much longer trip than anticipated) and am so excited to start sharing everything with you! It was a great time, but I am super-tired right now and have a minor ear infection from the change in altitude from Toronto to Salt Lake City (the difference is almost 4000 feet!) - no worries though, I went to the doctor yesterday and should be right as rain in a few days! As many of you know Blogger went down on Wednesday (and all of the comments left on my last post have since disappeared), so I'm pretty happy that I didn't lug along my laptop to SLC! 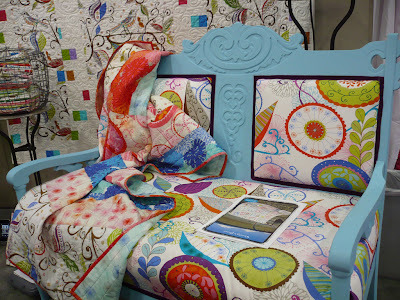 I have so much to share about Quilt Market so I'm going to divide it all up into a few posts over the next week or so! It was so fun staying with Jennifer and Doe, and really awesome to see some of my peeps again like John, Julie, Monica, Val, and Scott. It was truly awesome to finally meet some of my other peeps in person such as Heather, Katy, Tula, Erin, Aneela, Amy, Mel, Thomas, and Mo, and to meet some awesome new peeps like Kristen! Geez, I'm wracking my brain right now to make sure that I didn't forget anyone - I met and saw so many people this year that it all seems like such a whirl! Let's see, where shall we start? How about with the super-awesome Julie of Jaybird Quilts? Hurray! 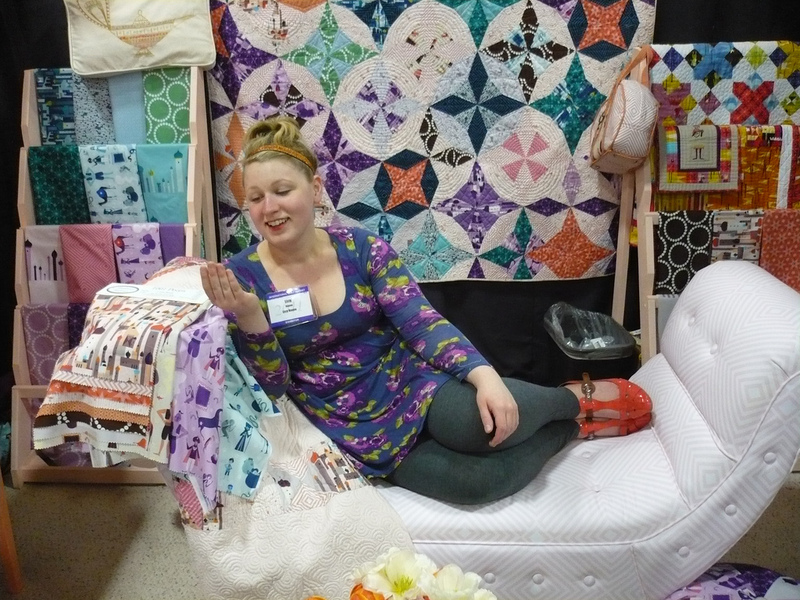 Here's Julie posing all sassily in her booth; isn't she just too cute?! 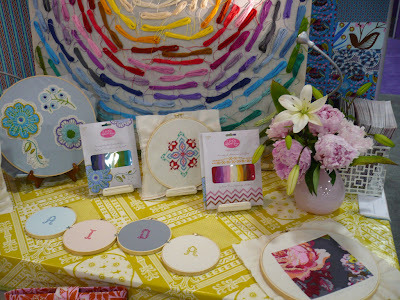 I really liked her booth and thought that it was well laid out - all of the colours were just gorgeous too! 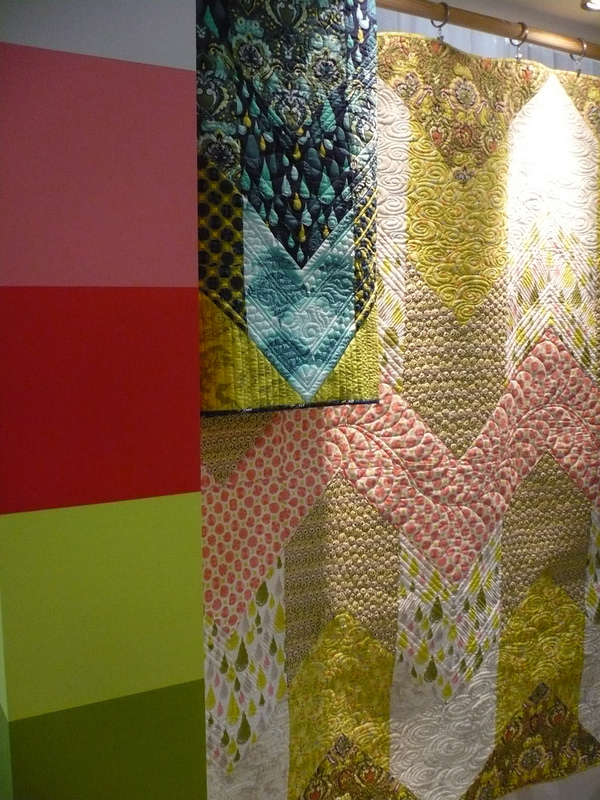 I love that not all of the quilts were hung completely straight and vertical, it added a lot of interest to the walls and I felt it was a reminder of the fact that the quilts we love and use are very rarely all neat and tidy. 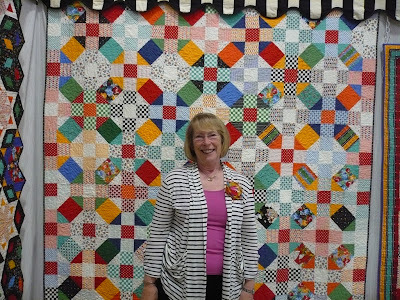 I'm probably reading a lot into Julie's choice to hang the quilts in that manner, but that's how it made me feel. And who should be right across the aisle from Julie? Why, the super-talented Lizzy House of course! I'm sure those ladies had a great time together! 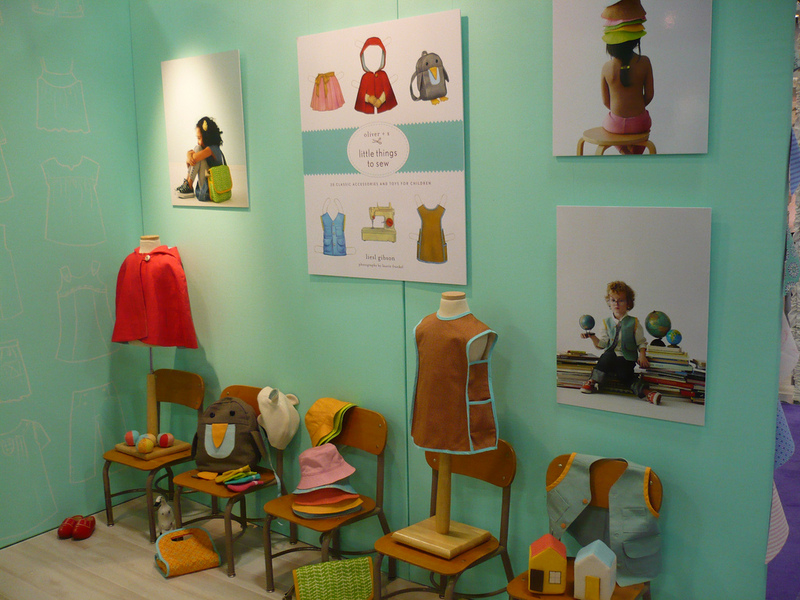 Here's Lizzy in her booth gazing into her imaginary mirror - too cute I say! The colours on 1001 Peeps are just amazing and I am so sad that Andover sold out of it before I got to their table at sample spree. Lizzy had the chaise that she's lounging on custom made for her booth and had one of her prints printed onto home dec weight fabric to cover it - it was pretty awesome let me tell you! One of the really neat things that Lizzy had in her booth was an iPad rotating pictures and pages from her upcoming book publication (which is available for presale now). I loved all of the little details in Lizzy's booth including the hanging lamps, pillows (which were sewn by the lovely Amanda), mini notebooks, and flowers. I have so much more to share with you guys but there's a few snippets from my first day walking the floor. I'll be back soon with more pics and some fun news that I'm waiting to share until I receive a picture from someone else! Have a good day y'all! 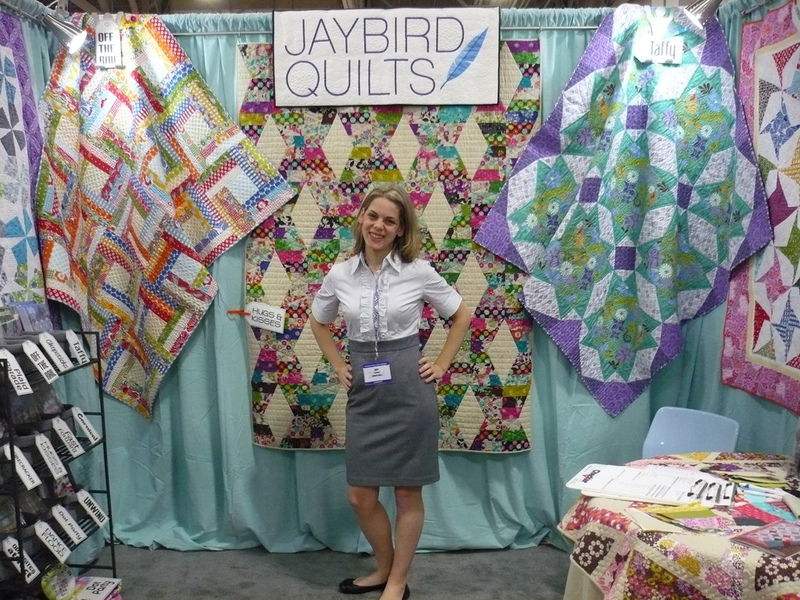 I'm off to International Quilt Market in Salt Lake City early tomorrow morning - hurray! Sorry for the bad picture up there, but it's after 11pm here! I'm almost all packed up; just need to throw in a few things tomorrow morning after I finished getting dressed - you know toothbrush, deodorant, etc. 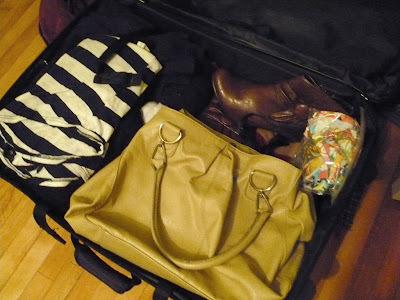 I'm only bringing two pairs of shoes - my black ballet flats and my flashy brown boots that you can see packed in my case. You can also see a baggie full of the over 150 2.5" squares that I cut for Thomas there and hiding beneath my (second) purse are presents for some of my awesome peeps! Eeeek, I'm so excited guys! I am planning on blogging from Market, however I'm not bringing my laptop this year, but I will definitely be Tweeting the whole time so follow me over there if you want to get updates about what's going on and see a picture or two as I go along! Alright off to bed now guys! I can not wait to see all my awesome friends tomorrow - we're going to have a blast! A Neptune bundle featuring one complete honey bun, and a fat quarter of each Tortoise Shell in Deep Sea, SS Pink in Algae, and SS Pink in Coral. The entire Castle Peeps collection by Lizzy House in fat quarters - there are three colourways each with 6 fat quarters. A scrap bundle featuring Flea Market Fancy, Mendocino, Munki Munki, Odyssea, some Katie Jump Rope and a few other things. 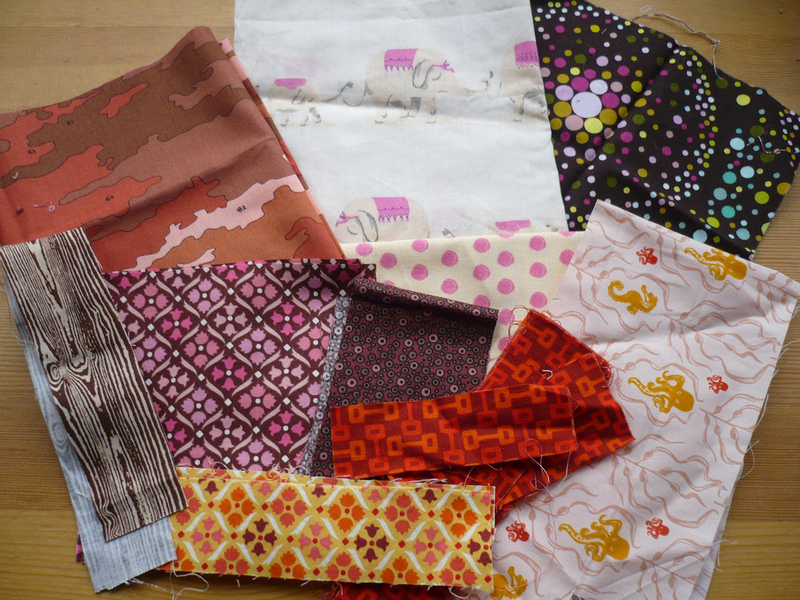 Another scrap bundle featuring Flea Market Fancy, Mendocino, Munki Munki, Chocolate Lollipop, and some Lush. 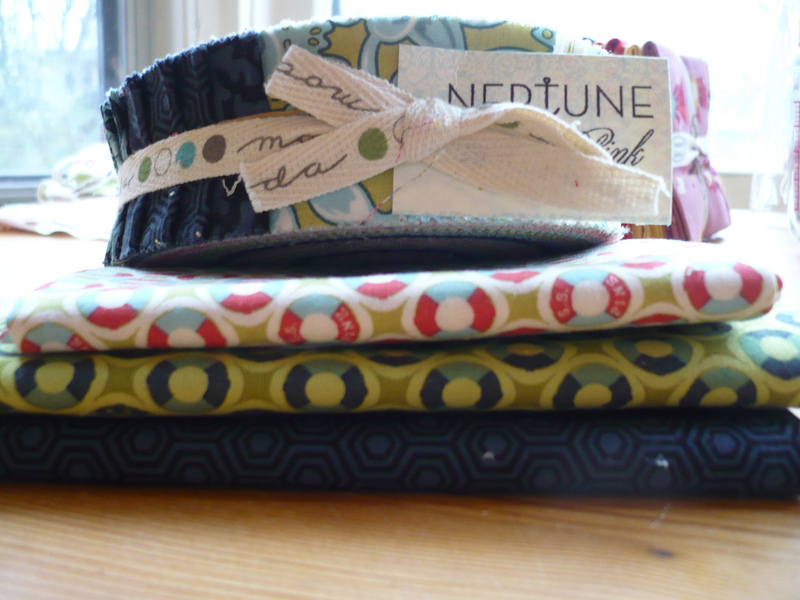 There's also some more Neptune, some Verna, some Urban Chiks Blossom, and a couple of Amy Butler packs. 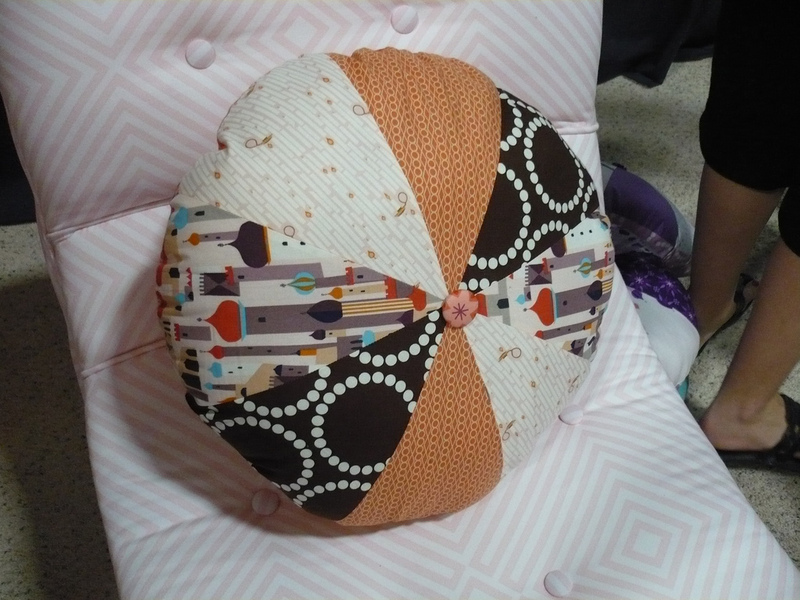 I also wanted to let you know that I have started a Flickr group for sharing pictures of things that you've made using any of my tutorials and patterns! 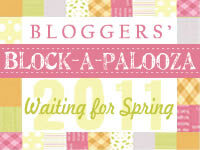 There are already a few things in the group (a lot of pictures of people's block-a-palooza blocks) and I'd really love to what you guys have been up to. Every once in awhile I will pick a few things out of the group to share here on the blog (if you don't want it shared her on the blog please mention that in the picture description), so if you've made anything using one of my tutorials or patterns go ahead and add it to the group! Oh geez, there was something else too but I seem to be blanking at the moment! Oh wait, The Frosted Pumpkin Stitchery is having a sale right now so if you were thinking about picking up my pattern, Itching to be Stitching, or one their other great patterns, now would be the time to do it! Okay that's it for now! 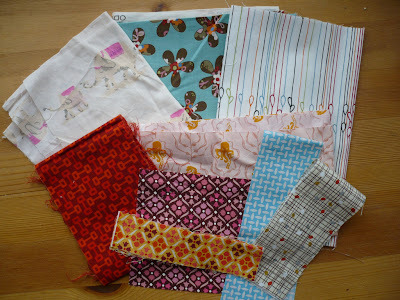 I'm working on a new quilt pattern right now which I can't wait to share with you! I'm hoping to be able to reveal it early next week, but if not it will make it's big reveal after I get back from Market! Huzzah!